In World Peace Day September 21st 2015, International Film Festival for Peace, Inspiration and Equality (IFFPIE) finally choose they’re choice to “Ailia" for Overall Winner. This movie is directed by Sameh Salem from Arab. This 19 minutes film tells a story about two children, one Palestinian, the other Israeli who are brought together by chance for painting a landscape. A conflict arises between them about who has the right to the land. Damien Dematra who is the founder and director of IFFPIE says that IFFPIE chose Ailia as the Overall Winner because this movie brings people inside a child’s mine who only wants peace. Plus the incredible cinematography from this movie makes a point. and the acting from the two children touched everybody’s heart. He hoped that this movie will move the worlds leader to make peace. IFFPIE also give the award of Man of Inspiration 2015 to the 39th president of U.S., Jimmy Carter that will be given to him in person at the end of the year in Atlanta, U.S. by the ambassador of IFFPIE ini U.S. IFFPIE gives the award of Man of Peace 2015 to Pope John Paul II from the movie John Paul II in America: Uniting a Continent. This award is given to him because even though the pope already dies he keeps on inspired people in the world until now. IFFPIE also gives award to; Andy Garcia, Alice Krige, Guy Davidi, Robin Shou and Leverne Ann McDonnell. 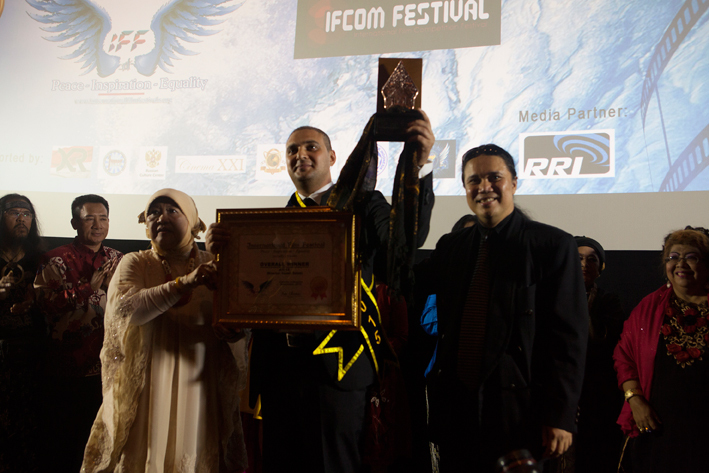 This festival is full supported by People Creative Council (DKR), i-Hebat International Volunteer, Russian Culture Center, World Film Council, Film Festival Alliance, Cinema XXI, Care for Children Foundation and Radio Republic of Indonesia (RRI) as media partner for inside and outside the country.